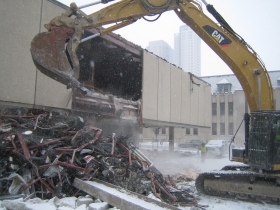 Northwestern Mutual is in the process of removing not one, but two buildings from downtown Milwaukee’s landscape. 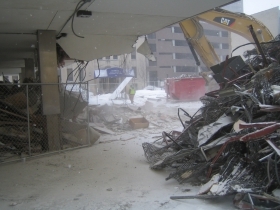 Deconstruction of the what NML refers to as the East Building can be seen from all over downtown as a tower crane hovers above. 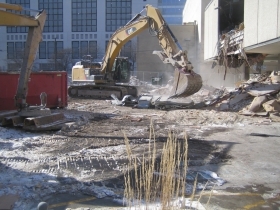 Once deconstruction is complete NML will begin work on the $450 million, 32-story, 1.1 million square-foot Northwestern Mutual Tower and Commons which will built on the site. 795 N. Van Buren St. Photo by Michael Horne. 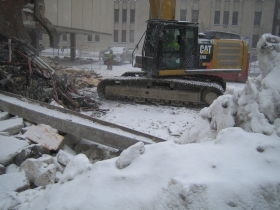 But a second lesser known NML demolition project is also underway, just blocks from the tower site. At the corner of E. Wells St. and N. Van Buren St., 795 N. Van Buren St., an odd little building has come to the end of its life and is being torn down. 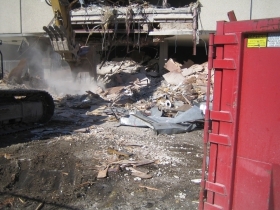 What is to become of the site? That was an ugly building but I really wish there was a requirement that there have to be a replacement planned before property owners can tear down buildings in the city. Downtown really doesn’t need another parking lot/empty space. Isn’t it possible to make some sort of city ordinance that bans new parking lots downtown? Long time home of the American Heart Assoc.?? It was a ‘tragic, out-dated, Brutalist-era’ building, with parking spaces at the street-level / streetscape in front of it. 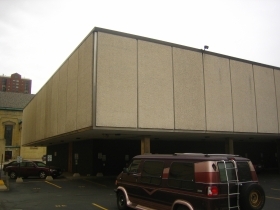 Taking up way-underutlized space at one of the highest-value locations in all of Milwaukee. There’s a term (besides the 3L’s) used in real estate called “Highest Best Use (HBU)” and this structure certainly WASN’T it at that location. I think we should all take a parking lot over it, cry a crocodile tear or two perhaps for its demise, but trust one of our best corporate citizens to quickly create a ‘higher better use’ for the site. They are after all, in the business of making a return for their policyholders (and they are damn good at it too! ), which is not running parking lots. We certainly do not need new ‘regulations’ that keep old, dysfunctional, space hog buildings standing any longer than they need to be. I knew, of course that there would be comments about this being an ugly building, and in its recent neglected condition it had become an eyesore. However, this was once a handsome and unique office building. A well-made, nicely detailed, small scale, well proportioned jewel of a building that held the corner with modest dignity. As a formal composition it was quite daring- an apparently heavy, solid and opaque box floating atop a flimsy transparent base. The kind of formal sleight of hand made possible by modern architecture’s break with centuries of formal convention. In its modest way, this building was kin to the War Memorial (Eero Saarinen). Before it was ruined by alterations to its lobby in the 1980s, the building at 611 E Wisconsin Avenue, once known as the IBM building, pulled off the same stunt with elegant wit (Harry Weese). In that case a multistoried precast concrete block perched atop a tiny glass lobby where an IBM computer the size of a Buick sat proudly on display. Perhaps the most visible example of the same formal idea is the inverted pyramid MGIC building across Kilbourn Ave from City Hall (SOM). At least it appears to be in responsible hands. 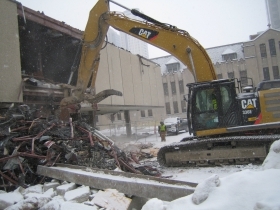 I believe the building currently being demolished was the work of Fitzhugh Scott, who created many handsome mid-century works sprinkled throughout the Milwaukee area, including the exceptionally handsome Fred Loock Engineering Center a few blocks away at MSOE. I hope at some point Milwaukeeans come to appreciate the fine mid-century gems in their midst before they all disappear. It was designed by Fritz von Grossman and finished in 1962. Considering it was built as a data center for Arthur Anderson (yes, that Arthur Anderson) maybe it is a good thing. It was, in its prime, an attractive and fitting building for that location. However, downtown seems to have grown vertical around it, and maybe it’s time to replace it with something a little taller. Of course, knowing NML’s parking woes, we can probably expect a low-rise garage. Especially if they don’t get O’Donnell.